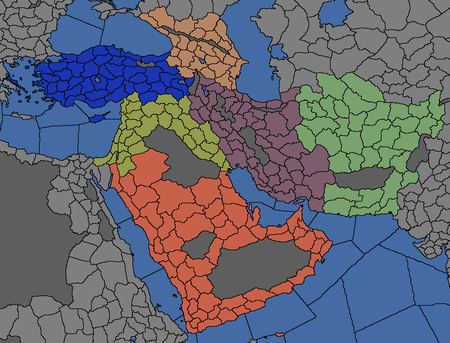 The regional divisions of the Near East and Persia super-regions. The Middle East regions are the combined regions of the Near East super-region and the Persia super-region. These regions serve as battle grounds between several powers vying for supremacy. One pair of such powers consists of the Ottomans and the Mamluks as they fight for control over the Near East super-region. At the beginning the Ottomans tend to be busy with the European front and consolidating the minor nations at its home region thus the balance of power between them and the Mamluks is preserved. As the time progress and the European theater quiets down the war between the two will begin. Either can emerge victorious in a one-on-one match between the two although the passing time may act against the Mamluks' odds. Any regional Coptic and Orthodox nations will strive to see either of the above two fall and crumble to gain control of their provinces with religious importance. Some of the more ambitious minor Anatolian nations eyeing the conflict between the two, may rise to the occasion, in an effort to gain control of the Ottomans' lands and power under the eventual banner of Rûm. Over at the Persian super-region, the Timurids are struggling to hold together their empire. At the moment the rebellious notions of its subjects are soothed down by the Timurid ruler, but he is old and not long for this world. As the years will go by, so will the sons of the old empire fight. Any nation with aspirations to grandness may take the decision to enthrone a Timurid prince and stake a claim for the empire's old borders. Only the turning wheel will tell if the winner will uphold the old traditions or whether they'll adopt new religious customs under the flag of Persia. Tired and beaten from the on-going war, the once glorious Timurids turn their eyes elsewhere, to the lands of the east. Why die trying to preserve an old name when there are new provinces waiting - no, yearning - to be conquered? − They wonder to each other. That is when the Timurids of old become the Mughals of tomorrow. Amidst all of these, two old and bitter rivals lie in wait. Aq Qoyunlu and Qara Qoyunlu, the people of the sheep, continue to survey their surroundings, looking for weaknesses and biding their time for yet another clash. Monarchy is the dominant government form in these parts (appearing mainly as Iqta and Despotic Monarchy). A few Tribal government forms appear in the central part and in the outskirts of the area (appearing mainly as Tribal Federation). A lone Monastic Order is present at the most northwestern part. Sunni is the most common faith in these parts. Shia is more commonplace around the central part and in the southwestern part. Ibadi is found in the southeastern part. Christian denominations ( Orthodox, Coptic, Catholic) are restricted to the northern areas. Anatolian is spread in the northwestern part (along with a tiny pocket of Western). Eastern is spread in the northern part. Muslim is present in the rest of these parts. Byzantine and French in the northwestern part. Caucasian in the northern part. Iranian in the central and eastern parts. Levantine in the western and southern parts. Notes: This region holds provinces necessary for forming Roman Empire and Rûm. The province of Antioch (2313) is of religious importance for Coptic and Orthodox nations. For countries in the Levantine culture group. Notes: This region holds provinces necessary for forming Arabia. The provinces of Medina (384) and Mecca (385) are of religious importance for Muslim nations (Mecca also benefits Christian nations). For countries in the Caucasian culture group and Azerbaijani countries. Notes: This region holds provinces necessary to form Armenia. The province of Yerevan (419) is of religious importance for Coptic nations. Notes: This region holds provinces necessary for forming Mongol Empire and Mughals. Notes: This region holds provinces necessary for forming Jerusalem and Roman Empire. The province of Jerusalem (379) is of religious importance for Abrahamic religion nations. Notes: This region holds provinces necessary for forming Ilkhanate, Mongol Empire and Persia. Yazd (433) is the only Zoroastrian province in the game. This page was last edited on 25 November 2018, at 19:25.